Here’s a little game to play next time you are heading down the aisles at the supermarket. Before you put each item in your cart, check the Sodium amount per serving under “Nutrition Facts.” If it’s Cream of Mushroom soup, it might say something like 850mg and list a percentage. That little fact explains that each serving of a half cup of soup has 850 milligrams of sodium (one of the primary elements of salt) and the percentage (around 35%) is the percent of YOUR DAILY TOTAL OF SALT that serving contains. Dietary guidelines call for no more than 2300 milligrams a day, about the amount of salt in a teaspoon. So that little cup of mushroom soup contains more than 1/3 of your daily sodium needs. A single turkey sandwich with one slice of bread, mustard, lettuce and cheese could add 1,500 mg of sodium – 2/3 of your total recommended daily input. For most people, our bodies create all the sodium they need. 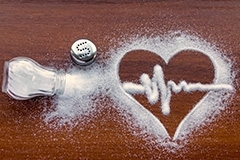 But we consume a lot of sodium and 75 percent of all the salt we consume comes from processed foods and restaurant food – especially so-called “fast food.” As a result, nearly nine in ten US children eat more sodium than recommended and one in nine youths have higher than normal blood pressure. Avoid types of food that contain the most sodium. More than 40% of the sodium we eat each day are in just 10 types of food with the #1 source, bread and rolls. Even foods that we might think are healthy, such as cottage cheese, are high in sodium. Sometimes, raw chicken or pork are injected with salt as a preservative even before they arrive at the supermarket. Eat foods that are high in potassium, such as fruits that grow on vines or leafy green vegetables. Potassium can help dampen sodium’s effect on blood pressure. If it says “instant” or “flavored,” check the label very carefully. It’s probably high in sodium. Limit the use of canned, frozen or otherwise processed foods. Use alternative seasonings when cooking, such as pepper, garlic, citrus juice or other salt-free spices. In addition to watching the sodium and salt you consume, be alert for foods carrying fats that become bad cholesterol in your body. Add some exercise to your daily or weekly routine. If you have high blood pressure, ask your family physician whether you should see a cardiologist for a full heart exam and diagnosis.